In addition to the "send message" function, now the automatic sending email function is also available. Set rules: Set up your rules for sending emails. The system will send emails to your customers directly when preset rules are triggered. Email sending records: Email sending records are visible for you to acknowledge which customers have been informed. Log in your 17TRACK Seller Account, go to Manage Messages. Click Email Rules, where you can set your rules to send emails automatically. Click Create rule in the right top corner, then the window of Create email rule will pop up. 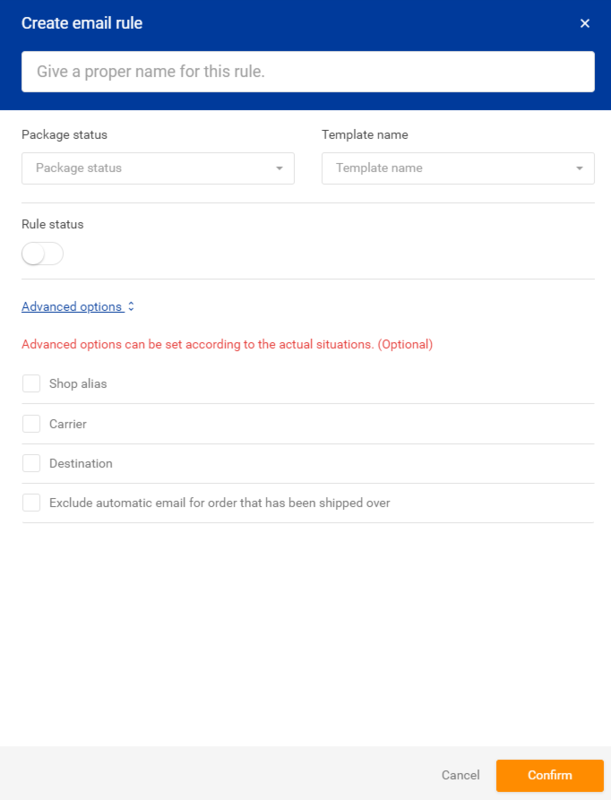 Firstly, fill in the name of the rule according to the hint; secondly, set the corresponding package status and select the corresponding template name; thirdly, turn on the Rule status then the designated template will be automatically sent for corresponding packages under the selected package status. If you need to set your email rules in detail, you can click Advanced options for more. The created email rules will be shown in the list. For your convenience, the list will clearly display the rule names you defined, the templates you selected, the updated time and the statuses. Meanwhile, you can quickly edit or delete the rules, or adjust the priorities of the rules according to the hint. Note: The emails being automatically sent will consume your email quota. Please pay attention to your email quota at any time! For more functions, they are coming up soon! Please stay tuned. If you have any feedback or questions for 17TRACK, feel free to contact us via serv@17track.net.